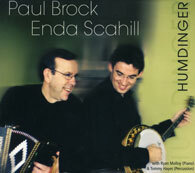 A master player of the button accordion, Paul Brock has been performing and recording for many years, producing landmark albums like "Tribute to Joe Cooley," with fiddle player Frankie Gavin, and leading the great band Moving Cloud. Those who have been fans of his playing are well aware of his partiality to Irish music from "the golden age," i.e., the 78 era, when the one-row melodeon, rather than the two-row accordion, was king. Here, playing melodeons in C and D, he is joined by the young tenor banjo ace Enda Scahill to emulate the sound from that era with a series of swingy and raucous tunes sourced from 78 recordings of John Kimmel, the Flanagan Brothers, William McElligott, Dan Sullivan's Shamrock Band, and other big names of the time. In fact, the two musicians, in whose respective playing one can hear specific techniques used during that period, do sound at times as if the Flanagan Brothers might have been reincarnated and brought into a modern recording studio. To complete the illusion, the dominant accompanying sound is, appropriately, that of the piano, played with great flair by Ryan Molloy, with a few percussive touches added by Tommy Hayes. Brock and Scahill really bring the music of the 78 era back to life with this one.